Honda ATVs or “4-wheelers” as we call them here in AK have been used here in Alaska since the 1970s. Camp currently owns a Red 4-wheeler and a camouflage 4-wheeler that has more than X miles on it and some bare tires. 4-wheelers are the most fuel efficient and best method of traveling from Unalakleet than any of the other vehicles that we currently own. Help us get 2 new FourTrax Rancher 420. 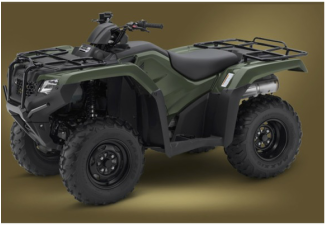 Another great Honda product is the Pioneer 700-4. This is a Side X Side off-road vehicle and would be very helpful up at camp! The Pioneer 700-4 has a bed that can transport cargo and can also be transformed to fit an extra 2 passengers in the back. With the extra seats, this would be the perfect method for transporting elders and campers from the Potato Field into camp! As many of you know, Bible Camp is already pretty green with all of the trees and grass and flora in the area. We’d like to be even MORE clean by transitioning to sustainable and eco-friendly energy. ​We would like to replace the fluorescent lights in the Ark with LED lights. Buy Bible Camp a light bulb! We need 19 fixtures and 38 bulbs! We would like to add solar panels to the roof of the Ark offset the cost of using the generator and leave less of a carbon footprint on God's beautiful land. This would cost $35000. Saunas or "Maqii" as Yupik Eskimos call it is in dire need of a new Sauna.